The most common and frequently used drills and taps in any gun shop - large or small - are the ones used to mount sights and scopes. And…there are literally thousands of these popular and profitable jobs to be done by gunsmiths. So, Bob B. put together this assortment of the tap-hole and clearance drills, plus the taper, plug and bottom taps needed to do these jobs right. Then, added a professional type "T"-handled tap wrench, and a complete cross reference chart showing the proper tap-hole drill and clearance drill size for each tap included. Plus, a 1 oz. sample of Do-Drill™ (the world's best drill/tapping oil) in a dropper-top bottle, and a tough, compact bench box. Whether you're just getting your shop set up, or been at it a while, this is one kit you need on your bench - 'cause it's the one you're going to use most often. SPECS: Sizes: 3-56; 5-44; 6-40; 6-48; 8-40 and 10-32, giving you 18 taps, 12 drills, Do-Drill™, Tap Wrench and Bench Box. Den vanligste og brukte øvelser og trykk i en pistol butikk - stor eller liten - er de pleide å montere severdigheter og omfang. And...There er bokstavelig talt tusenvis av disse populære og jobbene gjøres av børsemakere. Så, Bob B. satt sammen denne utvalg av trykk-hullet og fortolling øvelser, pluss taper, plugg og nederste kraner trengte å gjøre jobbene rett. Deretter lagt en profesjonell type "T"-behandlet trykk skiftenøkkel, og et komplett kryssreferanse diagram som viser riktig trykk-hulls drill og klarering bore størrelse for hver trykk inkludert. Plus, en 1 oz. utvalg av Do-Drill™ (verdens beste drill/trykke olje) i en drop-top flaske, og en tøff, kompakt benk-boksen. Enten du bare får din butikk satt opp, eller vært på det en stund, er dette ett sett du trenger på benken din - fordi det er den skal du bruker oftest. Spesifikasjoner: størrelser: 3-56; 5-44; 6-40; 6-48, 8-40 og 10-32, gir du 18 kraner, 12 øvelser,-Drill ™ , trykk fastnøkkel og benk boksen. Drilling and tapping rifle and handgun for scope mounts.Has all the most used sizes of drills and taps for the gunsmith.Can not fault the product. A little "spendy", but an excellent kit with quality American made components. The drills in the kit cut through steel like it was aluminum. Taps cut easily and precisely. Screws go in effortlessly after the job. The 1ST job I did was a 4-hole drill & tap for scope bases that came out perfect. After using this kit a few times, I can see it will do many jobs & last me many years. Wish I could expect this performance from every tool kit I buy. Bought my first set several years ago and worth every penny. Has all the useful size taps and drills. Finally wore it out after years of use and gonna buy another set. Thanks. The taps and drills are good quality,the bottoming taps need to be ground down a little to get deep enough cut for the threads. The tapper on the tap is slighly long to get enough threads in a average hole. The case could use a better holding method for the taps and drills they have a tendency to mix up. These are minor things for great products that Brownells have to offer for the professional and armature Gunsmithing needs. Most of my Gunsmithing needs are purchased from Brownells. This is a must have for any one who is a gunsmith, either home hobby or full time pro. This is a must have top quality tooling i have in my shop. Everything you need is in one kit. Tooling is top quality, not import junk. Used the drills and taps twice on the day they arrived and the kit had all the necessary tools! Okay so I'm not an expert gunsmith nor do I frequently write reviews but I got be honest this was a little disappointing. Number 1) The case is no help in organization as is. Its not a tight fit for the bits and taps so the minute you tip it more than 35 degrees all of the bits and taps are in one corner and your going to be re-organizing them. I fixed this annoyance by adding a chunk of foam. But it was a bummer considering the organized case is why I bought it. Number 2) On the topic of organization, I was disappointed when this 34 piece kit showed up in about 34 pieces. Now I get it, it's not a huge deal but if you buy this just know you'll spend the first half hour taking bits and taps out of tiny bags and putting them in the box. Number 3) For my particular case I ended up using carbide bits for drilling the holes. So be aware that this kit isn't probably what you want for heavy duty jobs. Number 4) for the gunsmith wannabes like me out there, I would recommend starting with the bare minimum of bits and taps and getting a good fixture, vise, or something to align holes. All the bits in the world won't matter if you can't get the holes to be where you want them. Spend money on fixturing. I had a cheap slide vise and that wasn't helpful. Number 5) The taps don't necessarily break out nice and easy as advertised. Maybe I was doing it wrong (how you hit a tap wrong to break it, I'm not sure) but I ended up drilling the tap out. I cannot properly express how rotten of an idea that was. I don't recommend it. Number 6) Another note on the case; you're going to break bits, taps, etc. You're going to buy more and you'll probably buy two or three of the most common taps when they break, and none of the less common ones. You may end up buying multiple drill bits for different projects; carbide, HHS, etc. All of this to say the case has one spot for each implement of each size. So if you're serious about drilling and tapping you're going to out grow the case in a hurry. Summary: Nice taps, drill bits aren't anything special, case is kinda cool but ends up being really cheesy. I would say this is not a rip off though because the overall price is roughly what you would pay for all the components individually. Just know what you're getting is not necessarily what you may expect (I know that's shocking for the internet. I would not recommend this kit to the general user. 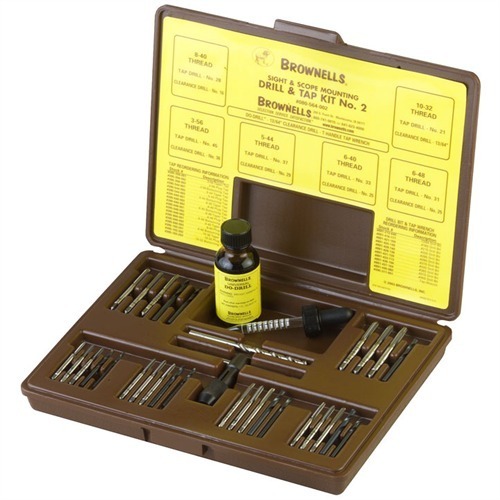 I would recommend this kit to a professional machinist who wanted to dabble in gunsmithing; in that case they know what they're doing, they have access to more drill bits of different material and sizes, and it gets them all the basics for a good price. So the number and quality of taps & bits that are commonly used on firearms definitely make this a good value. However, the storage is absolutely useless. Several others have gone off about this and I can't blame them. The taps are marked the drill bit sizes are not. They don't hold positively in the case, they just lay in there. The charts you see on the inside lid have nothing to do with where they fit in the case. I ended up buying a bunch of small storage tubes and marking those with the sizes. It looks like they decided to do an in house kit and picked up some sort of generic box from somewhere. Drill and Tap Kit No. 2 050806111080 Den vanligste og brukte øvelser og trykk i en pistol butikk - stor eller liten - er de pleide å montere severdigheter og omfang. And...There er bokstavelig talt tusenvis av disse populære og jobbene gjøres av børsemakere. Så, Bob B. satt sammen denne utvalg av trykk-hullet og fortolling øvelser, pluss taper, plugg og nederste kraner trengte å gjøre jobbene rett. Deretter lagt en profesjonell type "T"-behandlet trykk skiftenøkkel, og et komplett kryssreferanse diagram som viser riktig trykk-hulls drill og klarering bore størrelse for hver trykk inkludert. Plus, en 1 oz. utvalg av Do-Drill™ (verdens beste drill/trykke olje) i en drop-top flaske, og en tøff, kompakt benk-boksen. Enten du bare får din butikk satt opp, eller vært på det en stund, er dette ett sett du trenger på benken din - fordi det er den skal du bruker oftest. Size 8 - 36 x 1"